SPECIAL OFFERS: Sincere Personalized Care for Children and Adults. 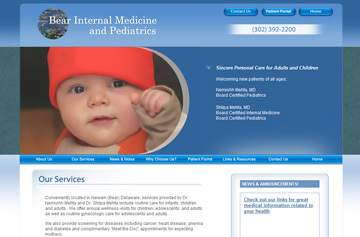 MORE ABOUT Bear Internal Medicine and Pediatrics - Drs. Mehta: Bear Internal Medicine and Pediatrics, PA This intimate primary care practice offers a unique personal environment for sincere comprehensive care. All appointments and after-hour coverage is done exclusively by the physicians. From newborns through adulthood, special attention is given to the varying needs of each age group. Their premier electronic medical records system allows for optimal data management and communication both with patients and within the office. This ensures better accuracy and prompt service to patients' benefit. The new patient portal allows for email communication directly with the office 24 hours a day. Nemishh Mehta, MD is board certified in pediatrics. His areas of expertise include management of chronic asthma and allergies, attention deficit disorder (ADD), assessment of infant and child development and behavior. His practice style includes a proactive approach to well care and vaccine preventable illnesses. Shilpa Mehta, MD is board certified in internal medicine (primary care for adults) and pediatrics. Her areas of expertise include chronic disease management for diabetes, asthma, hypertension and cholesterol disorders. Her holistic approach to patient care includes a comprehensive assessment for disease risk with an emphasis on preventive healthcare. ADDITIONAL INFO: Please visit our website at www.BEARIMPEDS.com or call us at (302) 392-2200 .